Photo: Screen capture via TV1 Samoa. The vaccine controversy has been an emotionally charged one, with supporters and detractors on both sides of the aisle nearly coming to blows at times over the debated merits and risks of the common medical practice. One thing that can’t be disputed are the many cases of acute harm that have been inflicted by these shots, however, and one of the most risky of all shots in this category is the MMR (triple shot) vaccine, which is said to vaccinate patients against measles, mumps and rubella all in one shot. This particular vaccine has also been one of the most controversial to date because of alleged reactions that kids have suffered, and now one of the most high profile potential cases of vaccine damage is rapidly unfolding in an island nation not far off the coasts of Fiji and New Zealand. 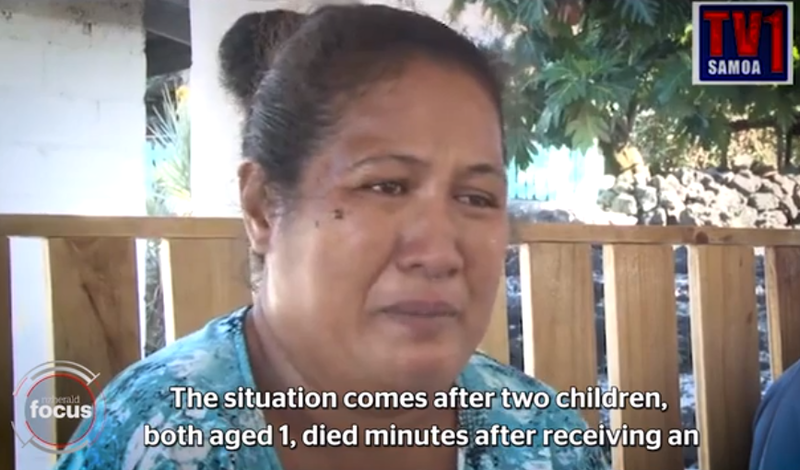 According to a news report from CNN, the Samoan government has launched an official inquiry into the deaths of two one-year-olds that took place after a routine vaccination at Satofu Hospital in Savai’i. The babies, born to two different families, died within “minutes” of receiving the MMR vaccine according to Television New Zealand. He said the inquiry will seek to find out whether negligence might also have been a factor in their deaths, while the country’s director of general health has halted the entire vaccination program until the inquiry is completed. Currently, the nurses who administered the vaccines have been stood down and are being supported, the New Zealand Herald reported. “Nothing like this has ever happened before, especially two deaths from one hospital district on one day,” said Take Naseri, Samoa Director General of the Ministry of Health. According to CNN, a vaccinologist at the University of Auckland noted that the child mortality rate has gone down because of these vaccines over time. But these assertions will do little to comfort the families of those who were lost, including Marietta Tuisuesue, whose one-year-old-daughter passed away shortly after receiving the vaccine. She’s now calling for answers as to what really happened. “Her body was turning black, so I ran back up to the doctor. She was still breathing at the time. We went into the consultation room and I came out while they worked on her. Not long after that, they came out and told me that my daughter had passed away,” she said according to Newshub. For more information on the incident including the basics on the MMR vaccine itself, check out the full CNN article by clicking here. The World Health Organization says that 6 million deaths are prevented worldwide each year by vaccines. But for the growing contingent of people whose families have been drastically affected in a negative way by harsh and at times deadly alleged reactions to vaccines, government statistics mean little in the face of their own deeply held feelings of personal pain, and their continued quests for justice and truth. Mata’afa Keni Lesa, a columnist for the Samoa Observer, stressed that the causes of death of the two infants in his home country were still unknown, but also wondered aloud whether any other potential deaths had been caused or contributed to by the triple-shot vaccine. He hopes that the authorities will investigate the situation as thoroughly as possible to get to the bottom of what happened once-and-for-all. “Let the deaths of these two young infants not be in vain,” he said in the column, which can be read in full here. Officials from Unicef and the World Health Organization were expected to arrive in the country on Wednesday in order to get to the bottom of what happened. But for now, the country is grieving and many mothers are thinking twice about whether the MMR vaccine is the best choice for their own kids moving forward. Thanks for reading, and please let us know what you think in the comments section below. Do you think there is something more sinister to the vaccine controversy than what public officials are admitting? Tags: mmr deaths in samoa, mmr vaccine causes deaths, mmr vaccine infant deaths, samoa american samoa vaccines, samoa mmr vaccine, samoa vaccination controversies, samoa vaccine controversy, samoa vaccine rates, and vaccine mmr deaths.